One of the most excellent but subtle themes of our Bible is the significant role of ordinary people in salvation history. Read the Bible even casually and it’s clear that God uses ordinary people to do extraordinary things. You can see this truth, for example, if you look at a few of the women in our Bible. Time and time again, first in the history of the Jews, then in the stories of the early Christians, women led the way forward. It is strong women, full of grace and chutzpah, who move God’s love affair with humanity forward. Laurel Thatcher Ulrich said, Well-behaved women seldom make history, and the biblical narratives bear this out. Think about Hannah, who arises of the chaos of the time of the Judges, to begin a new era by giving birth to the first great prophet, Samuel. Think about Ruth, an outsider who, because of her great love for her mother-in-law, becomes the great, great grandmother of King David, and thus becomes in the lineage of the messiah. Remember Tamar, also part of Jesus’ ancestry, because she refused to put away by her father-in-law who had impregnated her. Consider Mary, Jesus’ mother, who was likely only 13 or 14 when she received the angel’s news. And there are scores more: Mary and Martha, the sisters who were Jesus’ closest friends; Miriam, Moses’ sister; Deborah the judge; Lydia, whose home houses one of the first churches; Phoebe, a deacon leader in the Roman church. We could name many, many more. Often God has used ordinary women to do remarkable things in the lives of other people. This morning I want to add a name to that list, that of our own Rozette Huckabee. We are all here this morning to thank God for the way Rozette loved us, and the way we experienced God’s love and acceptance in her love. I met Rozette for the first time almost 20 years ago. I was the new pastor here, green around the edges, but anxious to do well. With the help of Inez Ryals I made appointments with many of the older members of College Park, visiting one a week, each Monday afternoon. I distinctly remember visiting Rozette, because she told me some great stories. She had a remarkable memory; she could remember every street number and phone number of where she had lived, and the names of every boy she dated. That Monday afternoon she told me a story about a boy she dated who was a twin, but she liked this twin over the next because he drank a little and they dated in a rumble seat. (A rumble seat is an exterior seat that opens out from the rear deck of a pre-World War II sportster.) I remember she said, “Is that terrible, telling the new preacher that you liked one boy more because he drank a little?” I was so impressed that a 79-year-old woman would tell me an honest, slightly racy story about herself. I just knew I was in the exact right church, with this remarkable woman who was so young at heart. And every visit thereafter, she never failed to impress. Rozette was born in Rowan County February 11, 1915 to the Oliver and Ida Young. 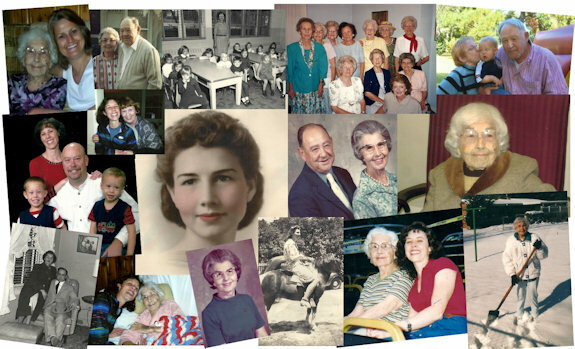 (She was just two weeks shy of her 99th birthday when she passed.) She was one of six children: three sisters, Mildred, Edna, and Louise; and two brothers, Frank and Elmer—all of these preceded her in death. I awoke this morning with the pleasant thought and hope that Rozette is with all those whom loved so very much: her sisters and brothers, her friends like Ida, and most of all with her husband Allen and only son Barry. Rozette met Allen when they both were working at MoJud Hosiery Mill where they both worked, but they worked different shifts. Allen noticed how beautiful she was, and had his eye on her for some time. Finally a mutual friend went to Rozette and told her that a friend would really like to meet her. So finally they met at the end of the sewing machines. (Rozette sowed the toe part of the hose.) She thought that Allen was so handsome, so they starting dating. The next day was Sunday, and Allen was late for his date with Rozette. Rozette met him at the door and said, “You know, you’re going to have to be on time to date me.” Allen responded, “Well, I was not going to come.” Why, she asked. “I saw you yesterday with that boy at the basketball game.” “Oh, Jasper?” “I don’t like you going with him,” Allen admitted. And Rozette said to Allen, “I was just waiting on you to ask me to go steady.” So she broke up with Jasper, and was completely devoted to Allen. They were married on December 23, 1939, 3 days before Christmas. Their only son Barry was born on July 31, 1941. Barry was certainly a beloved son. Rozette loved being a mother; she spent a lot of time with her son. She taught him to read. They enjoyed fishing together, and baking cookies after school. They joined College Park in 1950, over 63 years ago, the year this sanctuary was built. She use to check that her husband had three things before they left for church: Allen, do you have your teeth? Is your zipper zipped? Is your shirttail tucked in? Many of us need someone like Rozette to check us over with a checklist before we’re presentable. Allen was a terribly slow driver, while Rozette drove faster with verve. Sometimes Allen would drive so slowly that cars behind them would honk their horns, but Allen didn’t pay them any mind. One time he was driving so tediously slow that Rozette asked him, “Allen, are we parked?” It became a famous family saying. Actually, she asked him that right as they were turning into the parking lot of this church, and his response was to floor it, so that the car popped a small wheelie across this very parking lot. Alan would stop at the Staving’ Marvin to buy his one pack of cigarettes. Rozette would not buy them for him; she wanted him to quit. She had bought them for him by the carton early in their marriage, until they became too expensive and she became concerned about his health. She had been engaged before she met Allen, but the young man drank too much, so she broke it off. For years she taught 4-year-olds at Hester’s Creative School for Children and Young World Nursery-Kindergarten. She loved this job, viewed it as a calling, and was an excellent teacher of young children. Perhaps it was her gifts as a teacher of the very young that kept her young at heart as well. She had lots of students. The family has pictures of Rozette with large classes of children, 35 in one picture, 40 in another, dated the same year. This one aspect of her life, teaching child in their first years of life, may have been the most significant aspect of her life’s work, and the one in which she was the most influential. She and Allen were married 49 years. You all know where they sat together here. After Allen’s death in 1988, Rozette still saved him a seat. In fact, I can remember many Sundays in which she was one of the first ones to enter this sanctuary. I can remember her subtly hustling to get to her seats. She’d shake my hand, but she also be looking past me to make sure her place was not taken. I know she told more than one person who might have unknowingly made the mistake of sitting in the wrong place, “This is my husband’s place, he sits here.” Not “he sat here,” but “he sits here,” and, who knows, maybe he did. She loved College Park Church. When she visited Mary Ann and Darin, she wouldn’t go to church with them, because she said, it wasn’t her church. Instead, she’d read her bible on their sofa until they came home. She loved the people of this church who adopted her: Susan Phillips, Rachel Hutto, Kathy Kirstner, just to name a few. Jerry Elkins and Wayne Jones practically rebuilt her house and cared for her yard. She mowed her own lawn until she was 93, and she only gave it up then because Wayne forced her to do so, since she was tripping over the tree roots and in danger of falling. Like many other members of College Park, I liked to visit Rozette. She was a good listener, and with her excellent memory she could tell a vivid story that opened up the past to the listener. She loved photos and would share them with you if you asked. I believe she would listen to anyone, but she had her own mind, and then she would go and do or think whatever she thought best. We talked about her over the years about her church was changing, but she was on board with the trajectory of this congregation for a long time. Mary Ann said this about her grandmother: “You could talk to her about anything. She would never judge, but always wanted to help her family. 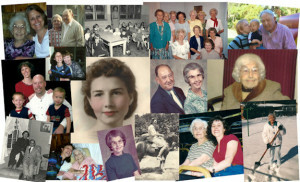 She was a wonderful homemaker, cook, teacher, confidant, mother & grandmother, and friend. She was loved by so many, and touched so many lives.” A great summary of this remarkable life, and why I think so many of us were drawn to her humble but strong spirit. A few final stories. When Mary Ann and Darin were first married, their marriage wasn’t going so well, things were rocky, they argued often. Rozette visited once, and finally she said to Darin, “You know what’s wrong, don’t you?” No, he said. “You both are focusing on what the other one is not doing, instead of what each other is doing. You need to stop focusing on the negative, and instead focus on the positive.” Darin thought about that, and said, “Well, you need to tell Mary Ann this too,” and Rozette said she would, and she did, that very afternoon. Something changed in their marriage after that. Things were different. Her small bit of advice made a huge difference. On another visit to her granddaughter’s home, Rozette said she was wanted to go home early. They both were working, and she was bored. Darin wrote her out a list of chores, half playfully, but when he came home from work, she had done them all: she said to him, “I got my chores down, Bossman.”’ Every day thereafter she did all the chores he asked her to. She loved her grandsons, Noah and Caleb. Even in her 90s she taught Noah to walk. She would walk with him around the track, the indoor circle in their home, and he would walk as long as someone gave him a finger to hold on to. But he wouldn’t make the transition to walking on his own, until Rozette walked with him, both with a waddling gait. She walked with him until she stopped and said, “Okay baby, time to go on your own,” and amazingly he did, and he was on his own. She had an intuitive gentle but firm way with children, and they sensed it. I could go on and on, and you could too. Many of you knew her and loved her for more than the nearly 20 years I knew her. She was an incredible woman who had her own mind, kept her own council, and had her own unique way of being in the world. She made history with us not because she was well-behaved, but because she was real, and kind, and keep active and involved, and made up her own mind about life and people. It was time for her to go on, to be sure; her last days and hours were not easy, but she leaves a huge hole in us. There is deep gratitude in me at being this remarkable woman’s friend and pastor, but it hurts to have her gone. God loved us well through Rozette, and in the window of her love, we saw God’s care clearly—here where a small Christian woman with huge love made a real and lasting difference in all our lives.